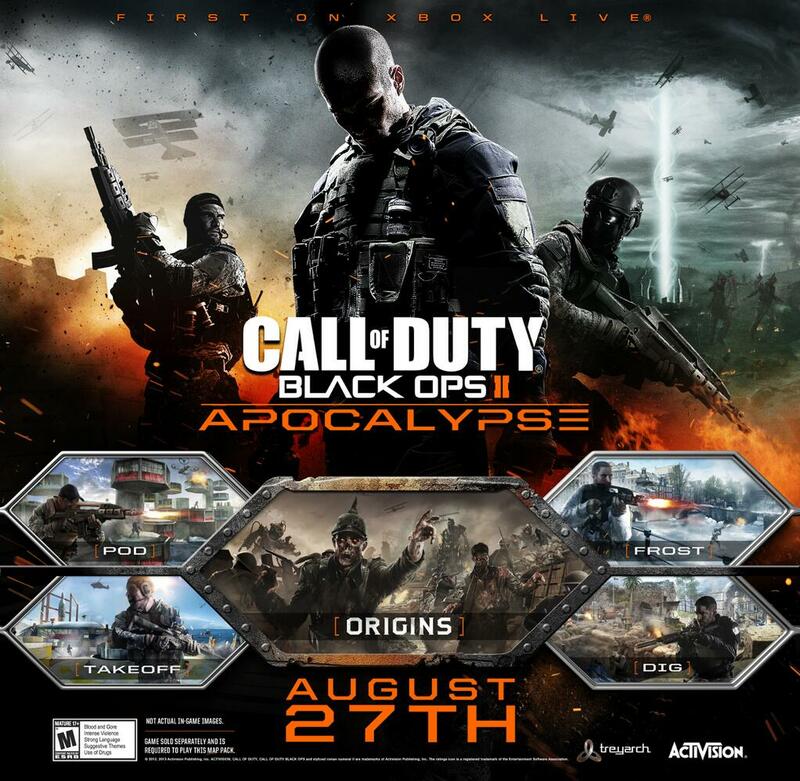 Apocalypse is the fourth and final downloadable content for Call of Duty: Black Ops 2, being released on August 27. The DLC pack will include 4 new mutiplayer maps and of course a new zombie experience called "Origins." The four mutiplayer maps included: Pod, which takes place among a pile of pods nestled in an abandoned cliff side in Tawain. Frost, a European city covered in snow, where a bridge separates two sides. Takeoff, a redone map of the original map in Call of Duty: Black Ops First DLC "Stadium," marooned in the middle of the Pacific Ocean. Dig, an updated version map of "Courtyard," from Call of Duty: World at War, which is in two archeological dig sites in Afghanistan. Zombie synopsis: "Unleashed after the Germans unearthed the mysterious Element 115, this next chapter in the Zombies legacy will explore the saga’s origins as players reunite with an unlikely band of soldiers that come together to defeat the greatest evil the world has ever seen, using a period-specific arsenal that includes Wonder Weapons that harness supernatural powers, a diesel-drone and Mark IV tank, as well a new perk machine and power-ups – and that’s just the start. Players will need all the help they can get to succeed in defeating the undead, as well as evading an unprecedented 1,000-foot tall robot abominations." As always, Apocalypse will be coming first to Xbox Live on August 27 for 1200 Microsoft Points. As for season pass owners, it will be free when it is available.